Click the links for reports on the Prefontaine Classic Diamond League meeting in Eugene, Hypomeeting in Götzis, British Milers’ Club Grand Prix in Watford, Halle International Throws, European Champion Clubs Cup, Vitality Westminster Mile and the Vitality London 10,000, while other highlights over the bank holiday weekend are below. 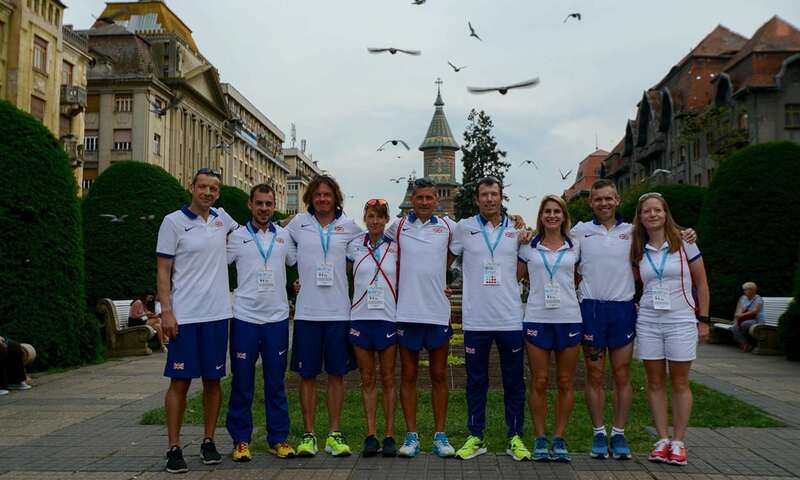 Great Britain’s men claimed silver and the women won bronze in very hot conditions at the 22nd IAU 24-Hour European Championships in Timisoara. Dan Lawson finished fifth to lead the team to silver medals, covering 253.43km, while James Stewart was 11th (244.35km) and Steven Holyoak 17th (237.36km). That combined distance of 735.15km saw GB finish 10km ahead of Germany, with France winning with 754.62km. Craig Holgate was 40th (205.45km), James Elson 67th (166.33km) and Pat Robbins 81st (125.99km). The event was won by Poland’s Andrzej Radzikowski who covered 265.41km. On the women’s team, Tracy Dean placed seventh on her GB debut with a total of 224.61km. Alison Young was 14th (214.46km) and Wendy Shaw 19th (205.98km). The team claimed bronze behind Poland and Germany. It was a Polish individual double as Patrycja Bereznowska, holder of the world best distance and reigning world champion, led from the beginning and looked fully in control, although her distance of 243.35 km was 16km behind her record and was another indicator of the tough conditions. The race took place over a 1.2km loop on a hot day in Ion Creanga children’s park. Many British athletes were competing and Perri Shakes-Drayton was among the winners as she claimed 400m victory in 52.00, her fastest time since her serious knee injury in 2013 and a European Championships standard. Jessica Turner won the 400m hurdles in 56.62, while Seb Rodger finished second in the men’s event with a 49.74 clocking, another European Championships standard. Jazmin Sawyers secured long jump victory and a Europeans standard with 6.66m, her best outdoor jump since 2016. Jonathan Hopkins clocked 8:30.52 for third in the steeplechase, his time also a European Championships qualifier. Grant Plenderleith ran a 46.34 400m PB. Richard Chiassaro broke the European record with a time of 45.26 to win the T54 400m, while Hannah Cockroft came close to her own world record in the T34 400m with 57.89. Cockroft also won the T34 200m in 30.64, her fastest time since 2015, and the 800m in 1:59.60. Charlotte Payne threw 63.89m for the second best-ever mark by a British under-17 hammer thrower and a European Youths qualifying standard. Youcef Zatat beat Scott Lincoln in the shot put, 18.21m to 18.04m. In the triple jump, Naomi Ogbeta jumped a 13.60m season’s best, while Ellie O’Hara broke her own Scottish under-17 triple jump record with 12.14m. Lucy Hadaway leapt 6.25m for a World U20s long jump standard. UK-based American Chari Hawkins scored 6137 points to win the heptathlon event. Diane Marie-Hardy was second with 5836 points. Jade O’Dowda broke the nine-year-old championship record mark set by Katarina Johnson-Thompson to win the under-20 event with 5610 points. Wales’ Commonwealth Games seventh-placer Ben Gregory won the decathlon with a score of 7517 points, 68 points more than he scored on the Gold Coast. The under-20 title was claimed by Nicolas Gerome with 7136 points. Divine Oladipo recorded 17.37m for the longest ever shot put throw by a GB teenager. Joel Leon Benitez was third in the pole vault with 5.35m. Josh Kerr won the 1500m in 3:42.62, while Alice Wright and Charlotte Taylor were second and third in the 10,000m in 32:19.03 and 32:20.25 respectively. Nic Percy was second in the discus with 58.17m and Amy Eloise-Neale was fourth in the 5000m in 15:29.89. Ivana Spanovic had a strong start to the season as after two fouls she leapt 6.66m and then 6.71 before a windy 6.98m followed by a legal 6.92m. Joel Kipkemboi Kiptoo won in an event record 2:13:33, while Caroline Jepchirchir claimed the women’s title in 2:47:35 for a Kenyan double. Yemane Tsegaye (2:08:52) and Gelete Burke (2:22:17) secured an Ethiopian double. The half-marathons were won by Canada’s John Trimaille (71:03) and Brazil’s Gabriela Rocha (78:38). Geoffrey Kamworor won his third title in the event in 28:18. In the women’s race the first three all beat the previous course record, with Agnes Tirop winning in 31:19 from Senbere Teferi and Caroline Kipkirui. Geoffrey Kamworor claimed his third @TCSWorld10K title in 28:18 from Birhanu Legese and Mosinet Geremew earlier today, while Agnes Tirop won the women's race in 31:19 from Senbere Teferi and Caroline Kipkirui.